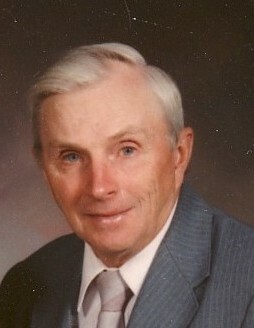 Melvin Swenson, age 92, of Strandburg, SD, died on April 12, 2019, at Milbank Area Hospital – Avera Health. Funeral services will be held on Thursday, April 18, 2019, at 11:00 a.m. at Watertown Christian Church. Visitation will be held on Wednesday from 5 – 7 p.m. at Mundwiler Funeral Home in Milbank. Visitation will continue at the church on Thursday, one hour prior to the service. Burial will be at Bethany Cemetery, rural Strandburg. Minister Gerald Volk will officiate. Melvin Signore Swenson was born on March 19, 1927, in Watertown, SD. He was the son of Eskil and Amy (Dahlberg) Swenson. Melvin grew up on the family farm near Strandburg. He attended school in Strandburg and graduated with the Class of 1945. Melvin was drafted in 1946 into the United States Army. His basic training was at Camp Lee in Virginia. He served in the finance department for the Occupational Army, working at First National Bank of New York in Yokohama, Japan. Melvin returned to South Dakota. He began his career in farming, working for his parents, then on his own. He was united in marriage with Margaret Louise Nowick on October 28, 1950. They were married at the parsonage of Bethel Baptist Church in Strandburg. Melvin served on the Grant-Deuel School Board for nine years. He loved baseball! He played on three different teams (Strandburg, South Shore, and Revillo) for 20 years. Farming was his passion – he especially loved tilling the soil. He raised cattle and grain crops, and never really retired until 2017. Melvin said he always felt the best while he was on a tractor! Melvin Swenson is survived by his wife, Margaret; his children: Rick (Cindy) Swenson of Milbank, SD; Terry (Nancy) Swenson of Elkton, SD; Debra Stanton of Sioux Falls, SD; and Tammy (Chuck) Wollschlager of Revillo, SD; 15 grandchildren; 2 step-grandchildren; 26 great-grandchildren; 6 step great-grandchildren; one brother, Elmo Swenson of Strandburg, SD. He was preceded in death by his parents: Eskil and Amy; son, Larry; and his sister and brother-in-law: Arlene (Orville) Johnson.